WINONA LAKE – Winona Lake Town Council Tuesday heard the Billy Sunday Visitors’ Center and Museum may close due to deficits. The council Tuesday approved a proposal that the town, in cooperation with Grace College and the Village at Winona and other potential individuals and entities, investigate transitioning the Billy Sunday Home and Museum into a visitors’ center. Winona Lake Clerk-Treasurer Retha Hicks said the Village at Winona will be suspending operations of the facility Dec. 31 unless a break-even financial structure can be achieved. Hicks said current deficits of the center are $60,000 per year and income is approximately $10,000 per year, while expenses of labor, utilities, repair and maintenance and cost of goods is approximately $70,000 per year. The proposal would seek to have Winona Lake, Grace schools and the Village at Winona combine financial resources and employ Museumcroft as an independent contractor to manage the Billy Sunday facility as well as the Museum of Winona History in the Westminster. The facility would serve as the gateway to Winona Lake and would be responsible for all visitor interaction. Bill Firstenberger, current curator of the museum, is the owner of Museumcroft. As a centralized dispenser of information, the facility would maintain a calendar of all events happening in Winona Lake and would be able to direct the visitor to the appropriate place. This would include, but not be limited to, summer park events, classes and facilities, town events, services, college events, village events, local school and church events and maintenance projects inside the town. Brent Wilcoxson, managing director for the Village at Winona, said the center has 7,000 to 8,000 visitors a year and local elementary school students visit the center. He said bus loads of people from Chicago also visit the center. “The museum has limited marketing ability, but the Billy Sunday home is in the top 1 percent of art and craft bungalows in the United States,” Wilcoxson said. Built in 1911, the Billy Sunday Home was restored according to Interior Department guidelines in 2000. The visitor’s center contains two offices of approximately 200 square feet each, a 20-seat video viewing room, women’s and men’s restrooms with 13 total fixtures and mechanical space. 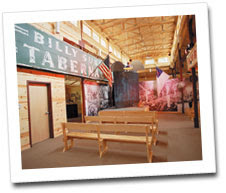 The remainder of the structure is dedicated to exhibit space related to Billy Sunday and his work. The buildings and grounds are owned by Grace. Currently, the Village at Winona provides all repairs and maintenance for the facilities including lawn/landscaping and snow plowing. The Village at Winona operates the facility. “I think we are sorely lacking a visitors center. I can see it being a gateway, but I am a details person and I want numbers and to be able to put things together and I don’t have enough information yet,” said council member Sue Gooding. She said she would like to see meetings between the town and the college to discuss the proposal. Gooding suggested there be a time extension to coordinate meetings between the town and Grace College to discuss the issue. Town Council member Jim Lancaster said there could be fundraising opportunities to keep the center open. “There are a lot of opportunities, but we need to have a good, solid plan,” Gooding said. Councilman Terry Howie agreed there is a need for for the visitors’ center. “I agree we need a visitors center, our budgets are set for next year, and we will have to look to see where we can find money and whether we can legally do what the proposal might be,” said Howie. Hicks said the funds would come out of the cash balance and the funds are there to help alleviate the deficit. What about several fund raisers a year, one being a "Billy Sunday Day" where people can come and see films of Billy Sunday maybe shown in Rodeheavor Auditorium. The PR system in Winona is pretty poor. One can hardly find postcards or advertizments about the place compared to some other attractions in this part of the state. Believe it or not I have spoken to long time residence of Warsaw that did not know the past history of Winona Lake or Billy Sunday. Maybe hard to believe, but true just the same.